In a hurry to check into my room at the hotel, I stepped across the rose petal and gave it no thought at all. I had just driven in from Nebraska to teach a watercolor workshop and they were putting me up in a beautiful downtown hotel. I checked in and as I walked out the door there lay the rose petal. I stopped - now my spiritual antennae was up and I recognized my heavenly Father's hand at work. Father, You are giving me a rose petal. Thank you. I reached down and gently picked the petal up. He gives me pennies and coins all the time. It is something between us that started long ago. When I see a coin, it is a hug from my Father in heaven. He is saying, "Well done. I love you." This was different - a rose petal. When I got to my room, I looked at it. It was a fragrant, cupped, fat petal from a red rose. Thank you Father, I love you, too. I had a little cellophane bag with me. I put the petal in it, casually opened my Bible and stuck it in. I taught the workshop and forgot about the petal. Some time passed and the Lord made a major move in my life. He prompted a friend to ask me to start a Bible study and teach her daughters how to live the Word of God. She reminded me that the older women are to teach the younger (Titus 2:3-4). I am diligent to pursue God in His Word and He has put people and ministries in my path since I became a Christian to teach me the practical application of how to live the Word. And I do that in my daily life, including painting. Now He was saying, "I want you to teach others." I prayed about it, He gave the lesson plan and we started. It has been like that ever since. He guides where we go and what is taught. He gives a subject and then guides me to resources from the men and women He used to teach me. Those resources are anchored in the Word of God. We stay on that course until He gives the next subject. It is His Bible study, not mine. One day as I was preparing for the lesson, my Bible fell open to the rose petal page. 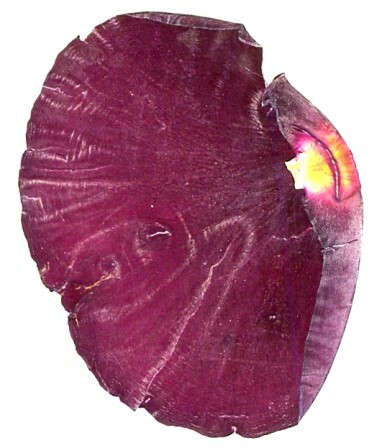 The beautiful petal was pressed flat and still very pretty. (The petal you see on this page is a computer scan of the actual petal.) It is a beautiful touch from the Lord. My eyes were drawn to the pages that had pressed the petal. I may have casually stuck the petal in my Bible, but those pages were chosen - it was not an accident. They were chosen by a loving Father with divine purpose. His anointing and unction highlighted certain Scriptures to me. "And they who are wise and understanding among the people shall instruct many and make them understand . . ." (Daniel 11:33 AMP). "And the teachers and those who are wise shall shine like the brightness of the firmament, and those who turn many to righteousness (to uprightness and right standing with God) [shall give forth light] like the stars forever and ever" (Daniel 12:3 AMP). The beautiful rose petal was a divine confirmation that I am called to teach others how to live His Word. It wasn't like I didn't sense that already, because He gives the lesson plans. But it was encouragement to stay steady in pursuit of the wisdom and knowledge in His Word - and continue teaching it. I wrote my name next to those Scriptures . . . shall shine like the brightness of the firmament and give forth light like the stars forever . . . shall instruct many and make them understand. It was a confirmation and encouragement - "Trust Me, I have purpose here." "The steps of a [good] man are directed and established by the Lord when He delights in his way [and He busies Himself with his every step]" (Ps 37:23 AMP). My eyes had stepped across the petal and onto the pages of my Bible that pressed it, drawn by the Holy Spirit to see and listen to His written Word. In stillness we find the roses God sprinkles across our path. The roses are many things: a real petal, a penny, a parking spot, green traffic lights, the warmth of the sun, a revelation of His Word that brings light to a situation - big and small rose petals from God. Is it in the spectacular that I seek Him - no. I seek Him in a river of love that leaves fingerprints along my path - rose petals that my heart can see when I will be still in the midst of my busy-ness. He has taught me to seek His face every day, every moment, every breath of my life. There is a hunger. I don't want to miss a thing. It started when I read Pr 3:6 NIV, "In all your ways acknowledge him and he will make your paths straight." I started thanking Him for green traffic lights, parking spaces, recipe ideas, acknowledging Him in all my ways, and soon I saw His fingerprints weaving my days - loving, guiding, molding and shaping my life. It is His Word - alive in my life. As I "do" the Word - He leave fingerprints for me to discover. ​ At first it was like a game . . . and then it became a flowing river of His love. I want to get back in line with His Word and stay close to Him. I like walking in that river and finding rose petals on my path. Thank you Father, I love you, too. The life we live here on earth is just a "little" piece of eternity. Your soul and spirit will live on after death. There is a decision each of us is born to make. It is the most important decision each of us ever makes in this lifetime. It determines where you will spend eternity. We go to heaven by choosing Jesus Christ as our Savior. The one who rejects Jesus Christ goes to hell. Heaven is a place of peace and so glorious that no eye has seen, no ear has heard, no mind has conceived what God has prepared for those who love Him. Hell is a place of eternal torment. God loves you and wants you to spend all of eternity with Him in heaven. That is why He sent His son Jesus Christ to earth. Jesus was crucified, buried, and God raised Him from the dead. His shed blood paid the price for our sins. When we choose Jesus as our Savior, His blood washes our sins away so we can go to heaven when we die. In John 14:6 AMP Jesus says, "I am the Way, and the Truth, and the Life; no one comes to the Father except by (through) Me." The Bible says that our faith can be as small as a mustard seed. My belief was so small that when my friend asked me if I believed in the resurrection my thought was, "Well, I don't not believe." She asked me to speak a salvation prayer. I prayed it. It is a choice. We are born to choose. This life here is not all there is. Without exception we all choose. But I would say to you "Make sure it is a conscious choice." You will not accidentally get into heaven - you have to choose Jesus Christ as your Savior. But you can go to hell by being passive and never getting around to choosing Jesus as your Savior. If you have never made a conscious choice and asked Jesus Christ to be your Savior, you need to do that. If you think you have but you are not sure - do it again and be sure today. I invite you right now to make a conscious choice and speak this prayer to the Lord. and Lord. Come into my heart. I repent of my sins. This is not an excerpt from the book. It is a sample of Dora Hagge's writing that is meant to bless you.